As we approach the April 13th release date of the Manics’ thirteenth studio album Resistance Is Futile, the ever-present Welsh rockers have released a second single in ‘Distant Colours’. It is another foray into their standard, earlier sound with this track not sounding out of place on Gold Against The Soul from 1993. With brushing percussion and light riffs against James Dean Bradfield’s subtle vocals, the track then opens into lighter shades with broad guitars and more powerful vocal for the chorus. This track does not surmount to anything special or surprising like Futurology, but remains faithful track unto themselves if nothing else. Three years off the back of one of their most accomplished works in in over a decade in Futurology, The Manics are back with their new single ‘International Single’ from their typically to-the-point album titled Resistance Is Futile which is due in April. Nicky Wire and James Dean Bradfield have already hinted at the album’s sound being influenced by bigger, stadium rock styles in what is evocative of Springsteen and War On Drugs. Within seconds of the songs opening however, Bradfield’s scratching guitar parts and scraping vocals instantly plunge you into familiar territory of early 90’s Manics. It’s typical of a Manics style largely omitted from their last album of the higher pitched strings or electronica acting as the uplifting trail against the heavier sounds around it. With lyrics in tribute to artist Yves Klein, the band lend several elements of their sound and methods over the years to this track with the hint of the heartland rock of Springsteen. In that sense it is not a song evocative of the variation and bold sound of Futurology, but for Manics fans it’s exactly what you’d want. It remains to be seen whether their thirteenth studio album will succeed in it’s creative aims, but at the very least we can enjoy the Manics just doing what they could do with their eyes closed. Kelly Lee Owens has had a long journey to get to her debut self titled album, not least the journey she made from North Wales to the musical ‘promiseland’ of London. Working as an intern at XL recordings, playing bass for acts and lending her vocals for other people’s projects were all part of this. A series of promising stand alone singles and remixes from Kelly have all culminated in this her debut album. This work is a reflection of her time in London and the influences she’s picked up since. She has been billed as a natural talent in the cool Electronic and Dance music she plies and a talented producer on top of that, despite many not having heard of her. The key thing for Kelly is; will she leave a lasting impression now? ‘CBM’ was from her Oleic EP from last year and is the only track from that featured on this album. You’re instantly struck by the clicking beats which bend in sound and focus with Kelly’s echoed and repetitive words echoing around the track with a flashing beat beside it. Her spoken vocals come in and out of focus much like the beats and the song progresses via numerous shifts and well placed synth additions. The song goes into a producer’s solo of sorts with almost vocoded synth chords veering off into a meandering display. In this track alone, the fundamental talents of a producer are there. You do wonder whether the album will sustain itself in its primarily angular and cold aesthetic though. ‘Anxi’ was made with one of those influential people in her recent life in Jenny Hval. The track flourishes gradually from the initial bouncing bass beats to the eerie vocals and string samples of the chorus. This fades away like mist into a pit of heavier beats bouncing off each other with the culmination of them being her ghostly vocal samples and echoed spoken words play in between them. This was indeed an improved varied piece of music with a greater musical awareness. ‘Lucid’ only goes on to confirm this more emphatically. Forlorn and whirring chords set against a high pitched string sample opens the track. The whirring chords form the foundation of the track with subtle rhythmic percussion layered over it as the song goes on. Kelly’s faint and shaded vocals extend into the space of the track and these make up the progression to the shimmering nature of the instrumentation. This then drops into more rhythmic beats and oscillating samples for a sleek and understated finish. Reverberating and warped electronica opens ‘Keep Walking’ with Kelly’s soft and wistful vocals taking an assured command of the song. This track has a slow progression with which the whirring and wiry instrumentation serves as a platform for the the vocals as opposed to being the driving force of the song. This is a notable shift in arrangment and method which Kelly pulls off just as well if not better. It is here she goes beyond the Dance and blocky Electronica to deliver a beautiful and multifaceted piece of music. ‘S.O’ opens the album and features an array of styles and sounds with the first minute alone. From sparse minimalist electronica, whirring strings and the light application of tribal beat samples. These go on to combine with Kelly’s airy vocals extending across the distant spaces of the track in a ghostly yet graceful fashion. ‘Evolution’ basically sounds like an improved Factory Floor track with the word ‘evolution’ repeated amongst dance beats and house sounds. However, it takes on a number guises here with this song basically having an awareness of depth and the fluidity of sounds and with this in mind, it is a more accomplished piece of music. That is how you could describe Kelly Lee Owens’ self titled debut. It is a talent of production making itself known to the world. There are occasions where you can predict the outcome of a song in it’s structure, but that’s one of the few predictable things about it. It draw from Dance, House and Electronic influences, but compelling and intriguing music from it by basically not stopping there and adding other elements to it. It’s not a revolutionary album, but she’s certainly created an evolutionary album for the genre. Welsh Indie band The Cradles are releasing their new single and announcing themselves to the world with ‘Ideal Girl’ on March 25th. They are being hailed by those such as BBC Radio Wales as a new Indie sensation, but listening to this track you find that there’s more to The Cradles than that. Their sound evokes that of the recordings of many a 60s rock group and the performance of both lead and backing vocals that are smooth and harmonious in unison. There’s more of a garage edge to their sound too, akin to The Sonics with their tumbling percussion and bass line and falling guitars. A track that translates an era on modern terms. Not a bad feat for starters. Someone obviously enjoys reading my rants about these guys so here I am again, to review their latest track ‘Cocoon’ from their upcoming album The Balcony. This time I hope they’ve stumbled across some originality, imagination or dynamism as opposed to every other piece of beige clad, guitar simplicity I’ve heard before. It opens in a typical mindless thrashing fashion plucked straight from 2001. It then goes on to go about a floating piece of Indie pop and then a Mumford-like tumble on the bridge section and then back into the lethargic predictability of a swooning Indie chorus with the cascading riffs and the sweeping backing vocals. To be fair this is the closest to any musical creativity they’ve ever came notwithstanding the blatant guitar solo and stomp-like finish. The only way I can see if this is enjoyable is if you’ve been in a cave on mars with your fingers in your ears since 1984. In desperation their PR have labelled them heroes of guitar music, but as far as I’m concerned they are it’s nemesis. Batting away any new ideas and showing guitar music to be plain and outdated so the sooner that tag is dropped the better. The Welsh Indie collective return with a single to release in conjunction and as part of the soundtrack for the film Benny and Jolene. ‘Little Mouth’ was recorded and written before they set to work on last year’s No Blues and as expected; has a light hearted and airy flow and feel to it via more conventional means of instrumentation and only slight, yet effective production statements. The lightly churning guitars and shimming piano’s and tambourines are tied down and controlled by the sharp percussion. The vocal combinations sweep across the instrumentals with ease, calm and warmth and all in all it is nicely worked track which rewards you more for the feel and energy of it rather than it’s workings and method. They are playing the Truck Festival today as well so check them out if you’re there and if you can’t, then get this song as a free download for you to swoon your summer afternoons away. On July 7th the Manics will release their twelfth studio album Futurology which, as promised is a quick turnaround from last years Rewind The Film which was the most profound Manics record for over a decade entwined around dark acoustic undertones with electronic forays to deliver lyrics of reflection and depth. 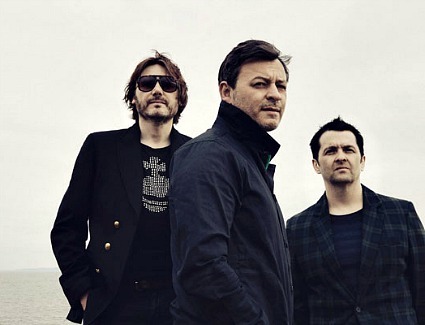 This album is expected to be more up tempo and a little more akin to the ‘traditional’ Manics sound. The first track to be officially unveiled from the album is ‘Walk Me To The Bridge’ which is a track that opens with a wonderful jolting riff with an indelible canorous tinge, opening the track with slick tenacity and purpose. Alongside it runs it with James Dean Bradfield’s close and slightly warm sounding vocal before it the bursts with the light of electronically charged pop chords set against the heavy beat, bass line and shimmering guitars along with the now razor sharp vocal from James. It’s by no means the greatest song they’ve ever produced but it has a infections rhythm and that added lyrical dimension that you can usually expect from a Manics track. Make sure you mark July 7th down for their twelfth album as it will probably be well worth a look. The four above are from Llandudno in Wales and are THE stereotypical British indie band. Or whatever mutation of indie we’re at now in 2013. If you’d like a quick judgement they’re halfway between Arctic Monkeys c.2006 and The 1975. ‘Pacifier’ has the typical rotating riffs with the little trail coming off it and the large, distorted strikes of the guitar over the top along with the cymbal-heavy percussion in some vague attempt to fill the sound. I could lose count at the numerous times this has been done since about 1993. Every influence I hear is coming from everything that had ran its course around seven years ago. The fact the seem to paint their influences on their foreheads is little comfort for it either. This sound has been worn down to dust now and if you want to plug your influences then do it with some creative twist please! That’s paying a better homage to them then blatantly mirroring them. What they do lack in creativeness and imagination, they make up for in energy and the slight quirks of the lyrics in this song. I bet this track sounds great live or at a club and I’m sure they transfer this energy to their audience too. But in terms of advancing music in any way shape or form; they don’t.